A. Brent Eastman, MD, FACS, FRCSEd (Hon) is a general, vascular, and trauma surgeon from San Diego, CA. Dr. Eastman is corporate senior vice-president and chief medical officer of Scripps Health, the N. Paul Whittier Endowed Chair of Trauma at Scripps Memorial Hospital, La Jolla, and a clinical professor of surgery-trauma at the University of California, San Diego. Dr. Eastman is the outgoing 2012-2013 President of the UCSF Naffziger Surgical Society. In 2012, Dr. Eastman was installed as the 93rd President of the American College of Surgeons (ACS) during Convocation ceremonies at the 2012 Clinical Congress. 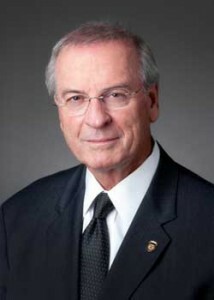 A Fellow of the ACS since 1976, Dr. Eastman has been deeply involved in the governance of the College, particularly as the Chair of the Board of Regents (2009–2010). Dr. Eastman began serving on the College’s Board of Regents in 2001. As a Regent, Dr. Eastman assumed the role of Chair of the Central Judiciary (2007–2009), the Scholarship (2005–2008), and the Finance Committees (2008–2009), as well as a member of the Board of Regents Honors Committee (2011–2012). He also served on the ACS Member Services Liaison Committee (2001–2002), Comprehensive Communications Committee (2010–2011), and Patient Education Committee (2009–2011). A dedicated trauma surgeon, Dr. Eastman was a particularly active member of the ACS Committee on Trauma (COT). He was COT Chair from 1990 to 1994 and helped to create and was the first Chair of the COT Trauma System Consultation Committee (1999–2003). Furthermore, he has served as an instructor for the internationally acclaimed Advanced Trauma Life Support®course since 1982. As Chair of the Board of Regents, Dr. Eastman played a key role in the College’s efforts to provide care to the victims of the devastating earthquake that struck Haiti on January 12, 2010. With Scripps Health CEO Chris Van Gorder, he made two trips to the country in the first few weeks after the earthquake hit, leading operating teams and securing appropriate resources.